Made it to the end, excellent post! As far as the conclusion being a satisfying one or not, I inititally latched on to the "Tony Dies" theory in hopes of finding satisfaction. But your summation of the final episode's place in the series seems even more effective and overall enjoyable to me. Not to mention your theory being much stronger! Thanks for pointing out the holes in the Bob Harris analysis. Judging by the size of this post, it was quite an undertaking, and I applaud you. Chase made one hell of a series finale, but it's reads like this that make me appreciate it more and more. I appreciate that UP. Thanks for coming over and giving me a comment. I wrote this more to give question to the "Tony Died" theory and offer another possibility than anything definite, but this is how my thoughts have come together since the finale. And I do think it is important to consider the entire season and series when thinking on the ending. And jimmy the fish...um, thanks I guess. Not really sure how else to respond to your comment but I appreciate you reading and commenting all the same. You have an excellent post and I really enjoyed reading it. I have just read it through for the second time and have saved it to read again later. Thank you so much! Interesting that you referenced "In Camelot." I just posted on another board that that specific episode ends exactly the way "Made in America" does: cut to sudden black. So the ending of the series is not the first time Chase has used this editing technique in a Sopranos episode. And I haven't seen it mentioned anywhere else yet. Could the answer go back much further than the 6th season? I am not a sopranos expert,( I don't have Tivo, or dvr, so forgive lack of details) but I would like an opinion on this. Late in the final episode, AJ comes home, and Carm tells him that they are going to Holstens for dinner. AJ says he thought she was making... (can't remember what it was, not important). Carm says no, she has to meet some construction guys about the house, so they are going to Holstens. ( again, sorry about lack of detail or exactness, but not that important). Next scene is Tony raking leaves, looking up at the sky. Carm comes out, and tells Tony Holstens is the consenus, or the consensus is Holstens. ( can't remember which way she said it). The point of all this is, AJ clearly thought they were eating dinner at home, until Carm TOLD him where they were going. Carm then told Tony (with a pained look on her face) that Holstens was the consensus. "consensus" implies agreement. Clearly, AJ was not given a choice, nor was Tony. I don't remember Meadow being involved in the decision either. Was this simply an error in the writing, or who was the "consensus" with? Also note, that when Carm comes to the restaraunt, she doesen't even look at Tony right away, almost trying to avoid eye contact as long as possible. Any Thoughts?? Excellent. More comments. Keep them coming folks and know that I appreciate every one. To Kathy - Thanks so much. I am glad you enjoyed it and truly honored that you'd read through this long screed more than once. That is very much a compliment! Thanks again. To rocketman - I had not thought of the end of In Camelot, but I do think it ties into this series finale. If we can consider the last episodes (and episode titles) clues to where Chase as going, I think we must consider what the title Kennedy and Heidi meant and once you reference JFK and its Sopranos connection, one defintely has to recall In Camelot and how Tony realized his father's life wasn't near as grand as once considered. In fact, much of season five gives amble clues to where Chase wanted to end, IMHO, so definitely going back to previous seasons would help figure the finale. Thanks for the comment. To DjVerb - To behonest, I cannot tell if she was saying consensus or they could sit them at 6 (though I am told that restaurant does not take reservations.) Either way, I'm not sure that spoecific point is telling one way or the other for the final scene. However, it does inform the relationships in the family - Carm is too busy to cook, AJ is still the spoiled brat, living at home and eating Mom's cooking (see how he seems to want Carm's manicotti) and Carm and Tony are at once both the happy couple and still have all the problems they've struggled with. Not sure that hekps answer your questions, but that seems to play into the "full circle" nature of the finale, to be sure. Thanks to you too for the comment. i enjoyed your theory very much but need to put in a few of my unanswered questions, ok? Could the last bell that rings before the screen went black BE the third bell for little jimmy brown? also, what about the magic bullet comericial? also, the very last scene when jr shot tony? look at his face while laying on the floor, just like the coffin scene or bed scene at the beginning of the final. the thing i thought was interesting was when jr hid in the closet and the screen went to partial black. i guess i just see more clues pointing TO his death then away. the "tony lives" people use the argument that "we" got whacked because the last scene was from tony's pov but because of the magic bullet comericial where we are told about ALL the things it can do in just 10 seconds, well to me, its true and why call it a bullet? also, the "other side" lol..says chase left it up to the veiwer to come up with their own ending, "any way you want it" BUT chase HAD an ending because he said "some" have come close. i guess i just want to know what the "some" who came close, actually said!!! That's just it, maggie - I think in the end that looking for clues one way or the other for Tony's life or death is the wrong way to go here. Those that have come closest, I think, are those that are looking at the sum total of the series rather than trying to fit pieces together from the final episode or scene. We cannot prove that Tony lived or died from what Chase has provided for us on screen. But we can prove where Chase left his characters when the screen went black and that points entirely to Tony and family right back where they started and no better off. Thus, the "what" really does not matter. It's the "why" that interests me more. The above debunking of "Tony died" is not so much to prove an alternate theory but to show that an alternate theory is equally plausible such that the viewer might then begin to examine what else Chase might be saying besides whether Tony lived or died. He'll die eventually. We know that. But what of his life until such time? That, I think, is what Chase meant when he said "it's all there." 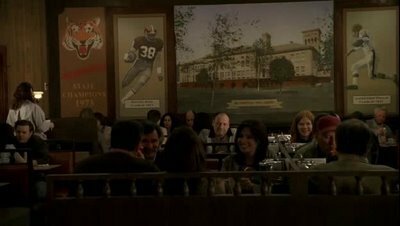 If you look, you can see it from pieces Chase began placing together from scene one, episode one back in 1999.
i will look forward to watching the sopranos over again from start to finish, keeping your veiw in mind. i really miss the show and would like to know if you guys start your conversation about season 1 like i read on your board that you might do. You are certainly welcome, maggie - and we are definitely rewatching the series over again at The Chase Lounge. In fact, the first episode is up tonight and we begin discussion of it tomorrow. Head over to the forum and take a look at Fly's new configuration too. Brilliant! That was an excellent analysis of the scene, especially in context of the rest of the series. I too hold Harris's blog in suspicion, he admits to missing much of the Sopranos and not being very knowledgeable about Catholicism. Six bells is a call to mass, at 6 pm, not for a funeral. And he says that mass is held at funerals, but he conveniently ignores that mass is held at weddings, and communion, and every day of the week, too. Thank you for your brilliant post, and I agree, Tony lives. Thanks very much Cheeso! It is gratifying to know my post is still being read these many weeks later. I took the liberty of following the IMBD links pointing to the IMBD thread discussing this and it appears many in the Tony died camp want to play my words just like Bob Harris'. Too bad they do not realize that the point of the above was to show that it is plausible to have either of the endings if you want to "guess" at what happens next. There are many clues one can "find" to support a theory, but very little "fact." Unfortunately, there is no way to know what happens next. All we can do is appreciate what we did get to see and that requires neither life or death for Tony immediately. It's a shame some folks need definite closure and thus cannot enjoy the episode and series for what it was. You're over-analyzing it. You're ruining it. Stop trying to force this crap down peoples' throats. Tony died, end of story. Chase has confirmed this himself, just not publicly. Right, John. Sure. You make such a convincing and erudite argument, how could I possibly disagree? Of course, I should note you are the one talking about it all these months later. My post was written some time ago. So who is forcing what down who's throat? Finally, if my interpretation of a television series finale somehow "ruins" it for you, I am very saddened by what must be your life at present. Goodness. I know it's been a while, but I just read your post for the first time today. I had never read the lyrics to "All That You Dream" before, and find the repeated mention of rain interesting, as it can be argued this is a reference to the rainy dinner scene in "Dream of Jeannie..."
Nothing big, just had to post it. That's quite a good point, Brendan and thanks for reading. After 4 years of writing this blog, this post has more comments than any other - I guess I can thank David Chase for that. I certainly appreciate any effort to read through my thoughts on this as I hoped more people would take a little bit extra from the series rather than "just an ending." It was an extraordinary effort of Chase's part and as I've thought on it more, I really love how he ended the series - save for that he seems to want his cake and eat it too - he cannot dispel certain rumors and peoples need to see Tony dead, but does not give enough of an answer to say that it did happen. He seems to want to let everyone have the ending they wanted and yet say it is not ambiguous. That is a shame, but I am firmly of the belief that once an artist has completed their work, it no longer belongs to them but now an audience. I just wish more of the audience for this show had that ability to see further than a shot that did not occur on screen. Whether it happened that night or way down the road is unimportant. I think the image of Tony we are left with of far more import. And Chase could not have been any more clear on that score. Thanks again for reading through as I know it can be tedious. I DO appreciate it, certainly! I can hardly beleive someone would write that much about someone else's opinion, its an odd way to present your own ideas. Interesting stuff though, none the less. The onion rings... with all the religious references, aren't those a metaphor for that round "holy bread" Christians are being fed at church? not sure what it means but that's what it reminded me, especially the way it was consumed by the three characters.